Magma Cookware is one of the fastest rising brands in the global cookware industry racking up several awards including the “Product of the Month” award given by the Good Sam’s Club. To say this brand is fast going places would be an understatement. This review’s focus, the Magma Products Gourmet Nesting Stainless Steel Induction Cookware Set with Non-Stick Ceramica clearly demonstrates why this brand is attracting a lot of the right kind of attention. What follows is an in-depth analysis of this 10-piece cookware set based on the following criteria: special features, overall long-term value, versatility, ease of handling and use, ease of maintenance or cleanup, and durability. Thanks to this cookware’s topnotch ceramic surface, this set convincingly sails through all the analytical criteria outlined above. There is no shortage of alternative non-stick surfaces available on the global cookware market. 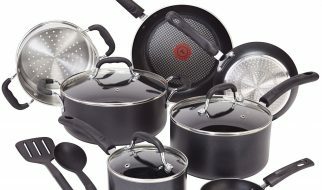 From diamonds to ceramic and all points in between, cookware manufacturers are constantly experimenting with the latest and greatest non-stick cooking surface technology to deliver the trifecta of value cookware shoppers are looking for: solid non-stick performance, surface durability over the long haul, and affordability. 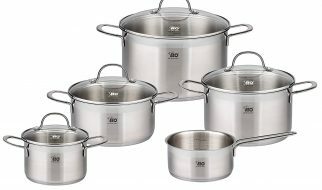 Well, the price of this 10 piece set, when averaged out per piece, and when lined up against other comparable cookware models currently on offer on Amazon and elsewhere, is actually quite a good value. You are getting a lot of dependable non-stick cooking surface action for your money. Thanks to Ceramica surface technology, this cookware set’s cooking surface area is not going to have debris stuck to it, flake, blister, pop, peel, fade, or stain. These pieces can take a lot of stirring, scraping, jabbing, and other forms of punishment cookware normally have to endure without getting compromised. In terms of heating performance, this induction cookware set generate a tremendous amount of heat and distributes it evenly and efficiently throughout the rest of its structure because of the great triple-clad heat disk creating its heat. Composed of aluminum sandwiched between to layers of stainless steel, triple clad technology not only ensures maximum inductive heat generation as the stainless steel layers interact with the magnetic current produced by the induction cooktop, this technology also enables even hit distribution-all in a light, easy to lift and move form! Not only are all the units in this set made of 18/10 grade stainless steel polished to a mirror finish, all units also feature solid Ceramica non-stick technology that can withstand a tremendous amount of punishment over the long haul without losing its non-stick qualities. The stainless steel bodies of these units can handle heavy use and are very sturdy. Paired with optimized magnetic heat generation capabilities courtesy of its ‘sandwich composite’ of aluminum set between two layers of high grade stainless steel, this cookware set is able to produce solid heat while ensuring it reaches all cooking areas. You don’t get uneven heating. You don’t get super-heated ‘hot spots’ while the rest of the cooking surface doesn’t get enough heat. Thanks to this technology and design, you are assured of faster cooking and more effective cooking heat management during the cooking process. The value of this set is also enhanced by its nested design. All items fit snugly into each other and you can put them all neatly in the box they came in so you can save quite a bit of scarce kitchen top space. Whether you’re cooking on a traditional electric or gas range or even with more recent infra red heating and induction technology, this set will perform. Indeed, its triple clad bottom heating disk design ensures that magnetic induction heating is generated quickly and efficiently conducted throughout each cookware’s form. In terms of cooking versatility, the different sizes and types of cookware pieces in this set ensures you that you will always have the right cooking tool to use on whatever you’re planning to cool. From soups to stews to fried food, this set has the cookware you need to do the job. As far as surface durability goes, you would not have to worry if you use one piece of cookware more frequently than the rest of the set. All set pieces feature Ceramica non-stick surface technology so you get maximum non-stick performance regardless of how otherwise sticky the food items you’re preparing and you can rest assured this non-stick performance won’t go away anytime soon. Ceramica can take quite a bit of punishment and remain completely non-stick. While this cookware set is made of 18-10 grade Stainless steel that’s been mirror polished, don’t let that steel component give you the impression that each piece will be unwieldy and bulky. Quite the opposite. You get great non-stick pieces that are easy to move around, lift, shake, flick, and otherwise move based on your cooking motions. Each unit doesn’t feel too heavy or tiring. You can easily move one item to the next heating pad to make space for another cookware. When it comes to just the cooking surface of these units, you are in luck. It’s Ceramica non-stick surface technology is so effective, you don’t have to do much to clean any debris left on the surface. You can quickly get rid of any grease or food scraps left on the surface. Just wipe down the surface area down with a sponge that’s been dipped in some soapy water and rinse. Mission accomplished. As for stains on the outer part of the cookware, you need to make sure they don’t dry out. If they aren’t dry, they can be relatively easy to wipe off with a sponge. If the spills have dried, soak the cookware in soapy water for a few minutes and scrub away. If you’re looking to get maximum value for the dollars you spend on this Magma cookware set, rest assured that its solid construction enables it to last a long time without being heavy, burdensome, clunky, or bulky. Quite a feat. 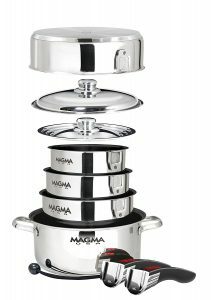 No wonder Magma has won so many awards for its cookware lines. While this product costs a bit more than many competing cookware ensemble package, its great combination of solid body construction, highly effective and efficient inductive heating capabilities and almost idiot-proof Ceramica non-stick surface feature makes it a great value over the long haul.